Teresa’s Pizza is located in University Corners at 2165 South Taylor Rd in University Heights. Known as the “City of Beautiful Homes,” University Heights is home to John Carroll University, a nationally recognized Jesuit university. 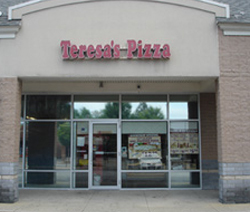 Teresa’s Pizza serves University Heights, Cleveland Heights, and surrounding communities. Please Note: Our menu and coupons are presented in PDF format. To view or print these files you must install the free Adobe Reader software.